Eating healthfully does not have to be a difficult feat of strength and will. In fact, I encourage you to create a simple salad every day based solely on ingredients you have in your house or can easily grab at your local grocer and dump into a bowl. I have been having so much fun with Mason jar salads lately. (Yes, food nerds like me think salads are fun.) Originally, my meal planning and prep work used to take up half a day every Sunday. I would divide all my ingredients into their own containers so I could mix and match and assemble a variety of veggie-friendly meals for myself during the week. But, lo and behold! I became a Mason jar salad convert. My Mason jars are extra large (32 oz) and light green, but you could go for the clear, smaller version if you’re slowly working your way into the meal prep and veggie lifestyle. Assembly is easy, but requires some thought as you don’t want your fragile, leafy greens sitting in a puddle of dressing for three days. HurryTheFoodUp shows you how to properly structure your salad and TheMuse gives you lots of ideas about the kinds of foods you can integrate into your salads, so play around and experiment with different flavors each week. Try to always have a protein (chicken or chickpeas), a carb (sweet potatoes or carrots), and a fat (avocado or walnuts) in your combo. When you’re ready, you can simply shake up your salad and eat directly out of the jar or shake, dump everything into a bowl, and toss in a handful of croutons. Ta da! For more information and ideas about how to get lots of veggies and other yummy, good foods into your daily meals, check out my previous blog post “It’s Easy Being Green…” And please leave a comment below and share with us what’s been working for you or what you’re struggling with. We’re here to help make healthful eating as easy as possible! I fare best when I eat vegetarian, but I don’t feel the need to make a show of it; I just like providing solidly healthful foods for people I love, especially when I know some of the day will include indulgences and sweets. Plus, it ensures that I’ll be getting my own fill of fruits and veggies…a true win-win. What kind of foods do you eat and traditions do you follow for the holidays? Do you like to cook or share the cooking responsibilities with anyone in your family during special occasions? Feel free to post your comments below. I look forward to reading them! One of my favorite vegan spots, Peacefood Café, has recently opened in the East Village/Union Square area and I am thrilled! There are so many creative savory and sweet options to choose from there, mostly made with meat substitutes like tempeh and seitan, but there are also some whole food dishes, like roasted or steamed veggies, green salads, and that sort of thing. For our meal the other night, my bf and I shared The Other Caesar Salad with tempeh “bacon” bits and a plate of deliciously spicy Chickpea Fries as starters, then he ordered the Penne Un-chicken Parmesan for his entrée and I had the PFC Un-chicken Basket (meat-substitute chicken fingers) served with a mild chipotle “mayo” dipping sauce on the side. I barely ate my meal since I couldn’t stop picking at my bf’s dish, so I ended up having it packed up as leftovers. Our dessert was a shared slice of peanut butter dairy-free cheesecake, which was a little on the gummy side; I might have preferred one of the monster cookie options instead. The issue with vegan foods is that not everything is healthy, so, if you’re opting for one of the meat substitute dishes (which are, technically, processed) or anything that doesn’t resemble a whole or raw food, just be sure your tummy can handle whatever’s in the recipe—like deep frying, soy, or wheat gluten—and be sure to ask your server if you’re not positive about what’s in the dish. For me, this kind of vegan eating is a treat as I have a very sensitive stomach, so I can’t overdo it; otherwise, it’s the same as someone eating a gallon of ice cream when she’s lactose intolerant. Since I’ve been on a liver detox cleanse the past two weeks, I probably should have waited it out before stepping into Peacefood Café, but I gave into temptation and, unfortunately, ended up paying the price for it—a sour stomach and a raging headache. Was it worth it? Probably, but I’ll definitely mix it up a little more next time and not eat something so heavy and processed in all three of my courses. I’m trying my darnedest to chill out with the overconsumption of sweets these days for so many reasons, one of which that, now that I’m unemployed, I don’t have money to buy pants the next size up. Cut up 2 bananas in chunks and freeze. 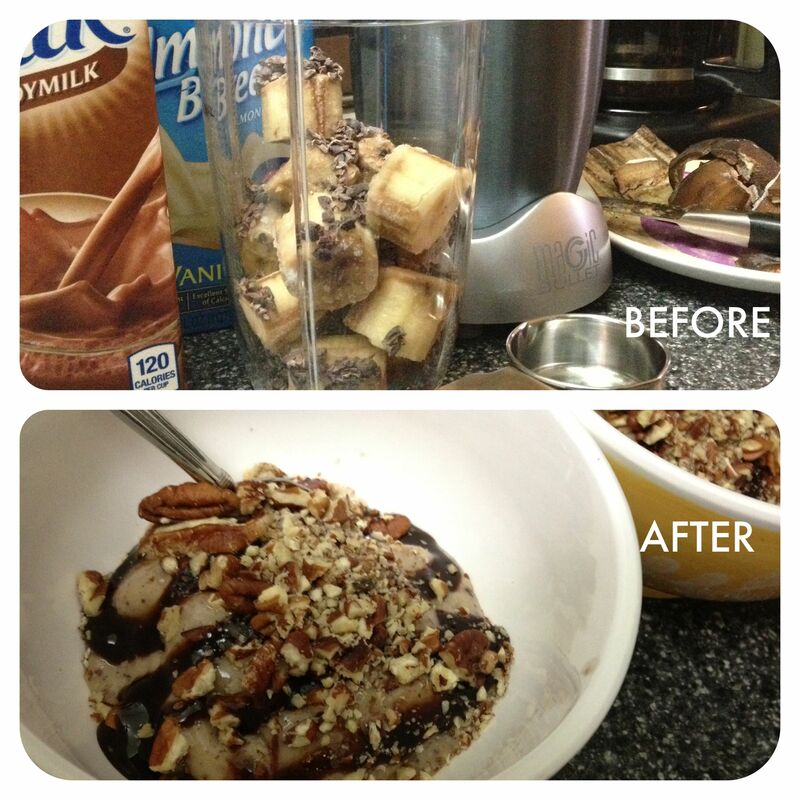 Place frozen chunks in a blender (this is my new go-to, btw). Add 1/4 c almond milk—or whatever kind of milk you prefer—or water. Add in 1 Tbsp ea cacao nibs and ground flax seeds1. Pulse until smooth, but not liquid. Serve with 1 Tbsp chopped pecans or your favorite nuts/toppings. 1I added these for a little power boost and they’re not awesome tasting on their own, so this is the time to hide some nutritional ingredients in your version: consider wheat germ or maybe even spirulina, although if you’re going with the latter, you might want to also toss in 1 tsp maple syrup. As some of you may know, I recently quit my job to go back to school, so I’m on a fixed budget now and trying to find ways of saving and doing as much as possible myself. Case in point: almond butter. I buy a brand that usually runs me about $14.00 for an 18-oz jar, so, instead, for $7.99/lb (NYC prices), I bought roasted almonds at Fresh Direct and decided to try my hand at churning nuts into butter. If you have a food processor, this will probably take a fraction of the time for you. I don’t, but I do have one of these thingies, so I prepped the almonds in batches, mixing and moving and mixing some more. That is literally all it takes to make almond butter, folks: mash up the almonds until they look like almond butter. Now, I don’t have kids (that I know of…am I right, ladies?! ), but the product I developed today made me feel as proud as I’d be if I did. Also, I’m pretty sure the amount of time and calories I burned were exactly the same as if I had had a baby, so, in a nutshell (get it? 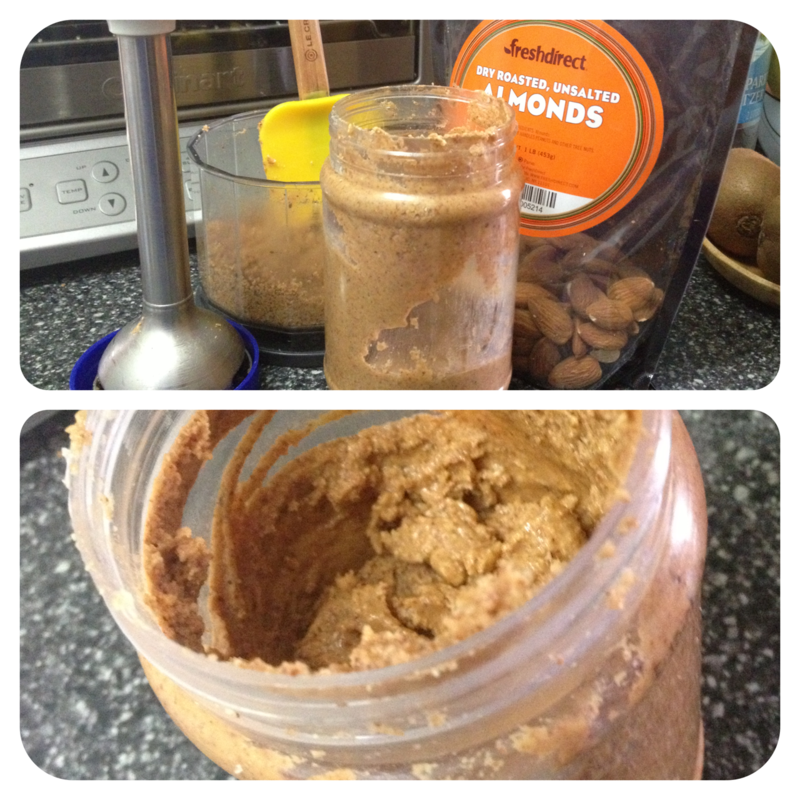 ), making almond butter from scratch is as easy as childbirth. I ate my meal so quickly the other night that I didn’t stop to photograph it, so you’ll just have to use your imagination while you read (or look at it yourself when you make your own version). When I got my first apartment back in 1994, one of my favorite meals to make for myself and when I invited friends over was honey-mustard chicken with two side dishes: (1) glazed onions and carrots and (2) egg noodles with butter. It would take no time at all to cook up and it was super yummy served immediately or as leftovers. I’ve moved into a more vegetarian way of eating these days and was craving that meal recently, so I thought I’d make a decent substitute with the ingredients below (serves about 2-3), replacing the chicken with seitan and the buttered noodles with vegan mac & cheese. If you want to make the original, I’ve included that information here as well. Either way, if you whip up this easy dish, please let me know how you like it. Cook up the pasta from “Part 2” according to directions on package. Drain, reserving about 1/3 cup of cooking liquid. Toss pasta and liquid well with remaining “Part 2 ingredients. Salt and pepper to taste. Fill a medium pot with water (leave about one inch from top) and a sprinkling of salt; cover and bring to boil over high heat. Uncover, lower to medium-high heat and cook carrots (“Part 3”) until soft, about 10 minutes. Simultaneously, cook the sliced onion from “Part 3” in a pan with the 1/2 Tbsp oil over extremely low heat, stirring often, until very soft and translucent. Add carrots to pan with onions when done cooking and mix in buttery spread and syrup until everything is coated nicely with the butter-syrup glaze. Salt and pepper to taste. To serve, you could place all three parts separately on a plate or spoon the honey-mustard seitan over the mac & cheese. This photo does no justice to tonight’s meal [note to self: learn how to take better photos of food] which was a vegan feast of barbecue-style tempeh, potato salad*, and the usual string bean side dish. In the world of processed vegan protein foods, the bf and I prefer seitan over tempeh, but I like mixing it up and tempeh won the coin toss this time. Everything here is pretty filling, so the recipe below can serve about 4. I also try to be as efficient as possible in the kitchen, so you’ll see that I’m using the same pans—and even the same boiled water—in this recipe’s steps. From “Part 1,” mix all the ingredients except the tempeh in a flat-bottomed bowl. Layer the tempeh slices in the bowl, spooning the mixture on top and around each layer so that all pieces are coated evenly. Cover and place bowl in refrigerator for about an hour. In a frying pan over very low heat, sauté the onion over the oil (“Part 2”), stirring often, until translucent, about 10 minutes. Add the salt and stir again, cooking another 4 minutes. Remove onions from pan and toast the bread (“Part 3”) in the same pan, about 2 minutes each side. Remove bread. In same pan, cook marinated tempeh slices from “Part 1” over low heat (add a little more oil if pan is too dry at this point), about 4 minutes each side. Fill a large pot with water (leave about one inch from top) and a sprinkling of salt; cover and bring to boil over high heat. Uncover, lower to medium-high heat and cook potatoes (“Part 4”) until soft, about 7 minutes. Remove potatoes from pot and place in bowl; dress with remaining ingredients from Part 4. In same pot with same water, bring back up to boil, then add “Part 5” string beans. Cook until tender, about 7 minutes. Drain and toss with remaining “Part 5” ingredients. 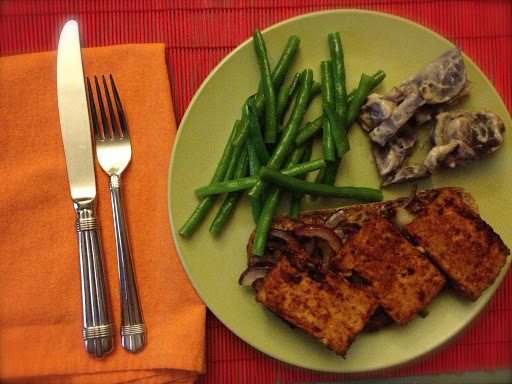 To serve, place one slice of bread on each plate; top with sautéed onions and 2 tempeh slices each (I used 3 slices in the photo above). Add a scoop of potato salad and string beans to each dish. Instead of oatmeal, I sometimes like to use quinoa for my morning meal. 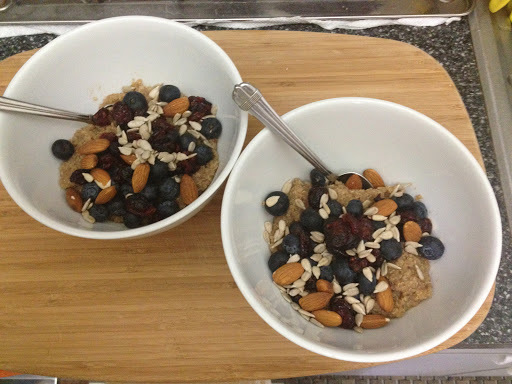 It’s just as nutty, filling, and tasty as an instant oatmeal package would be, but better, nutritionally (be mindful of your calorie intake for the rest of the day since quinoa’s a little up there). Today, I used the time while the quinoa was cooking to get in some yoga and stretching. Below is my recipe (serves 2); but, as always, feel free to add/substitute your own ingredients and make it palpable for you. From “Part 1,” in a small saucepan over low heat, combine quinoa and water. Bring to boil, then cover, lower flame and simmer until almost all water has evaporated (about 20 minutes), stirring occasionally. Remove lid, raise heat slightly, and stir in “Part 2” ingredients; cook another 5 minutes, stirring occasionally. Once mixture is smooth and all excess liquid has cooked off, remove from flame, divide into two bowls and top with “Part 3” ingredients.